The members and staff at Hardwicke are committed to equal opportunities at work and at the Bar. This commitment manifests itself in our policies and procedures, in our strategic objectives, and in our recruitment practices. We take a pride in ensuring that everyone has the best opportunity to join our team and to be the best they can be. We have a commitment to encourage others to join the legal profession. Our people are our greatest asset and we want to attract the very best talent possible. For more information visit our Recruitment pages and our Pupillage pages. We do not tolerate discrimination on any grounds in the selection, treatment or conduct of any of Hardwicke’s members, pupils or staff. In order to achieve our goals there are a number of initiatives we have been involved in over the years to contribute to the progression and diversity of the Bar. If you would like to know more please contact Amanda Illing, CEO, who works alongside our Equality Diversity & Inclusion (EDI) Committee. Hardwicke’s Equality, Diversity and Inclusion policies are reviewed annually by the EDI Committee when setting priorities for the year ahead. These priorities are reviewed by the Chambers Management Committee on an annual basis. Hardwicke is a Stonewall Diversity Champion. Stonewall is Britain’s largest charity for lesbian, gay, bisexual and transgender equality. The Diversity Champion programme is an employers’ forum promoting good practice on sexual orientation, its ethos being: “People perform better when they can be themselves”. Hardwicke was proud to collaborate with other chambers to create FreeBar, a network for everyone at the Bar who believes in equality for LGBT+ individuals and for all those who work at the Bar – whether you are a member, pupil, member of staff, member of the judiciary, or a person who works with members of the Bar. If you would like more information, please email info@freebar.co.uk or ashley.allen@hardwicke.co.uk. 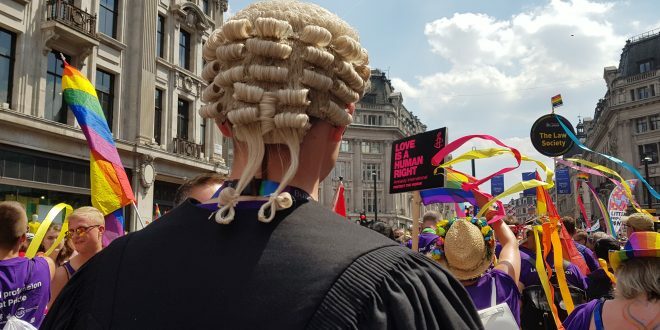 Our members have also commented on LGBT+ issues facing the Bar and the judiciary in the media. Appropriate facilities for disabled people, and disabled access are maintained to ensure that a visit to Hardwicke is thought out carefully and meets your needs. Accessible toilet facilities are available; guide dogs for people with impaired vision are welcome; a laptop computer is available for any conferences attended by people who have impaired hearing. If a visitor has specific requirements they are encouraged to speak to one of our Front of House team to ensure we can do everything possible to make your visit to Hardwicke comfortable and easy. Hardwicke is dedicated to the promotion and advancement of women in the workplace, and specifically at the Bar. Hardwicke’s members and staff belong to numerous women’s gender equality groups and industry fora to promote and support gender equality, particularly in areas of the profession historically dominated by men. Hardwicke is proud to have been top ranked as Black Solicitors’ Network ‘Chambers of the Year’ in 2011, 2012 and 2016. The Bar Standards Board Code of Conduct states that a summary of the Diversity Data submitted by the Members of the Workforce be published on chambers’ website by 31 December 2012 and thereafter every three years. The summary for our 2016 data, in accordance with these rules, can be found here (Hardwicke Diversity Data 2016) and below. Hardwicke is keen to promote mental health support and wellbeing in the workplace, and has an internal scheme – the Employee Assistance Programme – to help support these objectives. 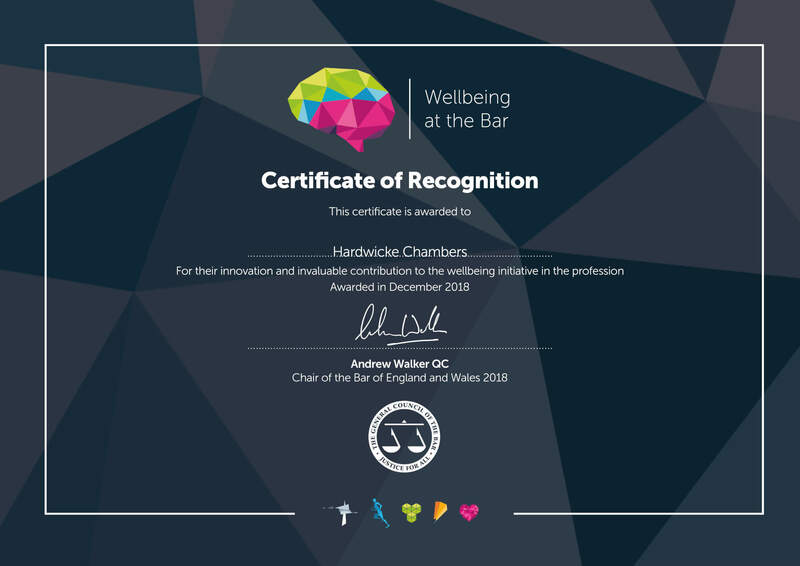 Hardwicke has been awarded a Certificate of Recognition from the Bar Council to recognise our efforts to promote wellbeing.